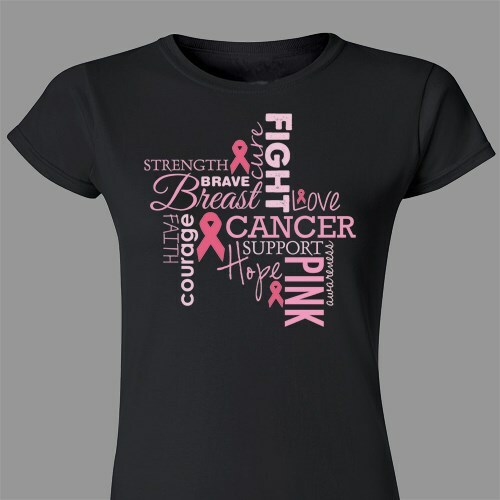 Your courage, strength and determination to find a cure for breast cancer will show each time this inspirational t-shirt is worn. Spread your awareness with pride by wearing Breast Cancer Awareness T Shirts at your next awareness walk event. This breast cancer design is available on our premium 100%, soft style cotton women’s t-shirt, machine washable in adult sizes S-3XL. Our women shirts are 4.5 ounce, pre-shrunk, with double-needle sleeves and bottom hemmed. Today’s Price: $17.99 In Stock! Sizes run small. We recommend ordering one size larger.